This story first appeared in Alpinist 61, which is now available on newsstands and at our online store. We occasionally share stories from our print editions on Alpinist.com, but each issue contains many stories that are only available in print. CLINGING TO THE ICY SLOPE, three climbers squinted against a late afternoon sun. Two hundred and fifty meters up a couloir, they inched forward onto a flat ledge where they could finally place their whole feet. They extricated their frontpoints with care and stepped out to rest for a moment on a small peak. Between them and the real summit loomed 200 more meters without protection from the boulders and ice that might rumble down upon them. Across the treeless valley, a glacial lake sparkled. The rise and fall of their chests and the sunlight that danced over the distant water were the only movements visible from these heights. FRESHTA IBRAHIMI, HANIFA (who asked that her last name not to be used) and Thomas Lund had left base camp at 6:30 that morning for this nameless crest just south of the 6320-meter Koh-e-Pamir (Dari for "Peak of Pamir"). They were deep inside the Wakhan Corridor, a 350-kilometer-long valley that juts like a finger from Afghanistan toward neighboring Tajikistan, China and Pakistan. The three climbers had spent most of the day gingerly stepping over slopes of scree that had given way, about an hour earlier, to a sharp incline of hard-packed snow. As the incline became steeper still, Lund pulled out ropes, and the climbers took turns belaying each other up the ice. The three were part of a larger expedition organized by Ascend, an NGO that aims to support Afghan women developing leadership skills through mountaineering and community service. Altogether, five Afghan female climbers and two Norwegian guides had hoped to make the second ascent of Koh-e-Pamir, first climbed by Italian alpinist Carlo Alberto Pinelli in 1971. (American Dylan Taylor had led a 2012 attempt, which stopped at 1000 meters up the southwest face, turned back by fifty-degree ice covered in rotten snow.) For the women, the four weeks in the Pamir Mountains represented their first extended alpine expedition; and, for several of them, it was also the longest amount of time that they'd been away from their families in Kabul. A few days earlier, the group had made an attempt on Koh-e-Pamir, but when several members of the team struggled with exhaustion and one fell ill to food poisoning, Ibrahimi, Hanifa and Lund decided to test themselves against this lesser summit. Now, at 3 p.m. on August 16, 2017, Ibrahimi gulped in deep breaths of thin air, trying to still the roar of nerves that clouded her usual calm. Already disappointed by their earlier failure, she wanted to make up for the loss with a summit today. And they were so close. But the brilliance of the blue above belied the swiftly approaching dusk. Soon the talus below would be too dangerous to navigate, even beneath the half-light of the moon and a full field of stars. There were other risks inherent in the backcountry of Afghanistan: after close to twenty years of military intervention and international aid, the nation was at its most insecure since 2001. The Taliban controlled over 40 percent of the countryside. According to the United Nations Assistance Mission in Afghanistan (UNAMA), 2,640 civilians had been killed and 5,379 injured as a result of armed conflict in the first three-quarters of 2017 alone. During the first half of 2016, the Afghan judiciary had recorded more than 3,700 cases of violence against women; many others had likely gone unreported. at same year, the UNAMA had observed an increase in extrajudicial punishment of women under strict, local interpretations of Shari'a law. 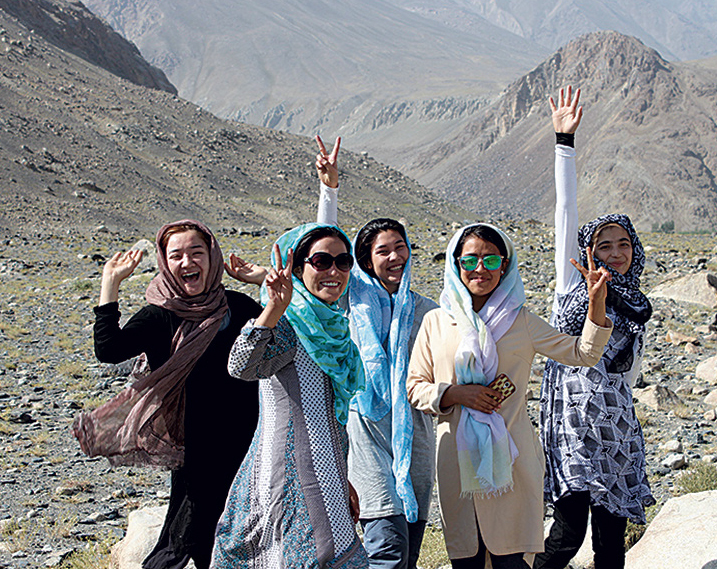 Amid the granite peaks of the Pamirs, these five women were helping to create an Afghan narrative of mountaineering that, above all, valued their own ideas of freedom—both on the mountains and off. But like mountain dreamers before them, the women faced significant challenges: from their own internal battles, to the lack of funding to support alpine pursuits, to the country's overall instability. As a staff member of Ascend, Ibrahimi understood all of this. But as she rested on the second mountainside that they would likely abandon, she contemplated leaving her companions and continuing onward by herself. Instead, she looked down at the borrowed watch on her wrist and read out, "5511 meters!" When the three turned back toward camp, they took solace, at least, in the new altitude record that they had set for Afghan women. THE HIGH CRESTS and valleys of Afghanistan have long formed a basis for narratives of cultural identity. The main range, the Hindu Kush, runs diagonally across the country, a bare mass of jagged edges that reach nearly 8000 meters at the Afghan-Pakistan border, before flattening to the southwest, as if dissolving into the desert sands. Nearly half the country's land rises above 2000 meters, and for communities in both the hills and the plains, the mountains influence all aspects of Afghan life: the climate, water sources, soil quality and trade routes are all determined by proximity to the great heights. For two thousand years, the passes of Afghanistan's many ranges served as crossing points on the Silk Road, connecting the ancient cities of China to Parthia. Around 300 BC, Alexander the Great is believed to have marched through the Khawak Pass to Bactria, where he established a dynasty. The Chinese monk Xuanzang passed the "Snowy Mountains," as he called them, in the seventh century during his journey west. Marco Polo traveled eastward through its high cols to the court of Kublai Khan in the thirteenth century, and during the fourteenth century, Moroccan writer Ibn Battuta made his way through its winding paths. Battuta noted a possible explanation for the mountain range's name: "There is a mountain called Hindu Kush, meaning "Hindu-killer," because many of the male and female slaves transported from India die in these mountains because of the violent cold and the quantity of snow." Another possible derivation of the name is Hindu Koh or "Mountains of India." Throughout Afghan literature, the mountain stands in as a symbol for the Afghan homeland and people. "Oh colonizer, the mountains are still sleeping, don't think that mountains are soft," starts a contemporary Pashto-language tarana. In these oral poems, Afghan warriors appear as both "righteous defenders of religion" and "defenders of land, mountain, and ramparts," as Irish scholar Michael Semple explained in a working paper from the Carr Center. Khalilullah Khalili, a celebrated Dari-language scholar, historian, and poet who left Afghanistan after the Soviet invasion of 1979, evoked the metaphor of the mountain to describe the determination in the Afghan spirit: "Never frightened of horrific torrential storms, / You rose, towering above the sea and plain, as a great mountain." During the late nineteenth century, the Wakhan valley had served as a buffer zone for the so-called Great Game between the expanding Russian and British empires. In 1873 an agreement between the two foreign powers ceded the northern part of the valley—marked by the Panj and Pamir Rivers—to Russia (the area is now part of Tajikistan). Twenty years later, the Durand Line agreement set the boundary between Afghanistan and British India to the south, leaving a sliver of land to Afghanistan that was only sixteen kilometers wide at its narrowest point, its terrain veering between verdant green, bare brown and snowy white. This became the modern Wakhan Corridor. Then in 1949 Communist China closed its borders, including the seventy-six kilometers it shared with the eastern Wakhan Corridor, finalizing the territory's conversion from an important stop on a teeming trade route to a backcountry cul-de-sac that few outsiders, even from the rest of Afghanistan, visited. AFTER THE SECOND WORLD WAR, King Mohammad Zahir Shah of Afghanistan leveraged the tensions between the United States and the Soviet Union as he aimed to modernize his country. Initially, Zahir Shah managed to play the global giants off each other: both provided millions of dollars of aid while hoping to sway Afghanistan toward one side or the other. For a time, rapid development spread through parts of the country. With its vibrant university, visiting jazz bands (Duke Ellington played in 1963), cafes and fashion shows, Kabul became known as "the Paris of Central Asia," a proud showcase of the twentieth century surrounded by the sentinel peaks of the Hindu Kush. It was this Afghanistan that Eric Newby, a British writer looking to escape from the fashion business, visited in 1956. Yet the observations that he recorded in A Short Walk in the Hindu Kush (1958) depict his dreams of an uncivilized frontier, rather than the realities of a rapidly developing nation-state. His writing placed the country beyond the changes of the rest of the world—or even the normal passage of time. On the high plains of Afghanistan, he found "one of the lonely places of the earth with all the winds of Asia droning over it, where mountains seem like the bones of the world breaking through." The landscape appears in his descriptions as a mere backdrop for the internal exploration—and external adventure—of the Western traveler. As English writer Evelyn Waugh described in his introduction to Newby's work, "It was not mountaineering that attracted him; the Alps abound in opportunities for every exertion of that kind. It was the longing, romantic, reasonless, which lies deep in the hearts of most Englishmen, to shun the celebrated spectacles of the tourist and...simply to set their feet where few civilized feet have trod." Newby was not, by his own admission, a climber; nor was his companion, the British diplomat Hugh Carless. 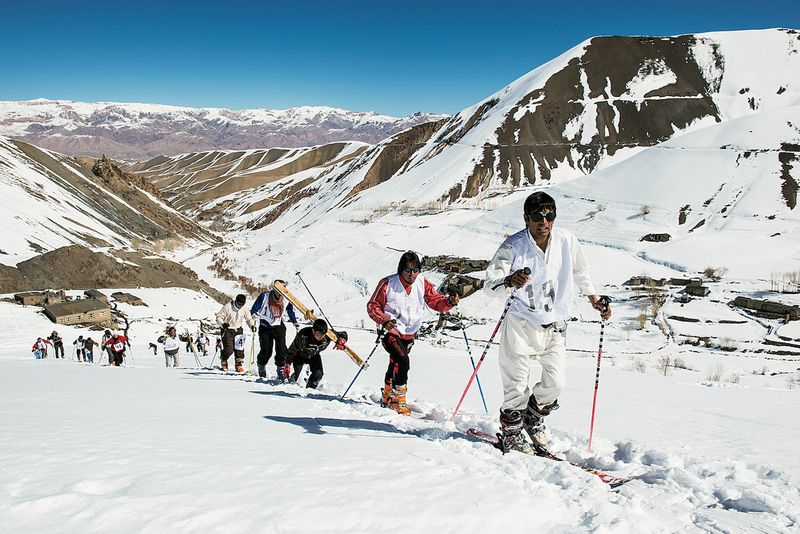 Nevertheless, they were determined to climb the 5809-meter Mir Samir. To prepare for the trip, the two took a three-day crash course on mountain climbing in Wales, and then they set off overland through Istanbul and Iran to Afghanistan. The pair blundered their way remarkably far up Mir Samir, which "seemed to be made from some sort of shattered granite," Newby observed. But their slow pace and ill-preparation eventually caught up with them. On their second attempt at an ascent, they scaled a gully with "the help of the [mountaineering] pamphlet" that they had been given in Wales. When the fractured boulders of the summit came in sight, "'demoralized' was the word that rose continuously to my lips," Newby wrote. "As the thaw continued and progressively larger rocks bounded past us on their way to the glacier, the childish 'it isn't fair' was only repressed with difficulty." On their third attempt, they got within 700 feet of the summit. But faced with the prospect of descending the crumbling face in the dark—or camping out on an unprotected ridge while projectiles rattled down from above—they turned around. Despite their inexperience, Polish mountaineer Bolesaw Chwascinski called theirs "the first serious attempt at mountaineering" in Afghanistan. Newby's objective remained unclimbed for another three years, until four Germans, led by husband-and-wife team Harald and Bobby Biller, summited the peak in 1959. As Harald Biller explained to British mountaineer Joyce Dunsheath, who would make her own summit attempt the following year, the ascent of Mir Samir was "more difficult than anything he had done in the Himalaya, not excepting Annapurna IV." Over the next few years, reports of unmapped terrain, hidden valleys and distant summits in the Hindu Kush poured into alpine journals, which noted dozens of ascents. In 1960 Toshiaki Sakai and Goro Iwatsubo, part of a six-member Japanese expedition from the Academic Alpine Club of Kyoto, attained the first ascent of the 7492-meter Noshaq, Afghanistan's highest peak, supported by eight local porters (unnamed in the accounts). From atop Afghanistan's highest point, they could just make out the mountains of Tirich Mir and Istor-o-Nal on the Pakistani side of the Hindu Kush, peeking out above an array of dark clouds. Though the climbers had waded through deep drifts of snow, the team leader Yajiro Sakato described their route as "rather easy and pleasant" in the 1961 American Alpine Journal. More challenging, perhaps, was organizing permits for the region. After three weeks of negotiations with Afghan officials in Kabul, the government rejected their request, which was to travel the length of the Wakhan Corridor, but granted them permission to climb in the Noshaq region instead. Ten days after the Japanese ascent, a team of Polish climbers repeated their feat. As the Cold War escalated, climbers from Poland—then part of the Soviet bloc—sought climbs in the politically neutral Hindu Kush, which seemed an ideal training ground for the Himalaya. In 1963 two Afghan climbers—Aka Mohamed Bahar, the thirty-eight-year-old headmaster of the School of Physical Education and Shamselhak Bharomi, a twenty-two-year-old teacher— joined a ten-man exploratory expedition led by Polish climber Andrzej Wilczkowski to the Shahar Valley. In his trip report, Wilczkowski noted that both Afghans had climbing experience, and that "their participation was most helpful during the travel through Afghan territory, also during the expedition's activities in the mountains." Various team members made first ascents on peaks over 6000 meters, but the Afghans' names are missing from Wilczkowski's summit report. He does note, however, that two members of the party had fallen ill with altitude sickness. As mountaineers from abroad ventured farther into Afghanistan's ranges, some began exploring the heights outside of the summer season. In January 1973, a ten-member Polish team left Qazideh village for the base of Noshaq, where they planned to attempt the first winter ascent of a peak above 7000 meters. After they established Camp 4 at 6200 meters, hurricane winds and freezing temperatures repeatedly forced the climbers to retreat to lower camps. "For three days we were holding down the tent with our weight, while the other empty one was torn away and thrown 700 meters down the glacier," Andrzej Zawada later recalled in the Alpine Journal. For nearly a week, they waited out the storm. Finally, the wind quieted. Over three days, the team pushed up to Camp 5 at 6700 meters. On the morning of February 13, Zawada stepped outside the tent. "It had become completely calm and I saw splendid stars over my head," he wrote. After thawing their boots over the stove, Zawada and Tadeusz Piotrowski began their climb. At the summit, Zawada estimated that it was -50 degrees Celsius, so cold that, when he removed his gloves, he "felt immediately that [his] fingers were getting blisters as if by scalding." With their ascent, the climbers shifted what was believed possible in alpinism, setting the foundation for 8000-meter winter ascents in the Himalaya to come. Zawada's 1973 winter expedition wouldn't have been possible without the support of seventy low-altitude porters. But his trip report left little room for sympathy for the porters' own lack of winter equipment. "Local highlanders were afraid of frost and snow in the mountains," he wrote. "They would not agree to go higher than the meadow Put Ghar (3400m), which was only two days' march away. There they could find fuel and warm themselves by the fire at night." It was only after climbers lent them their own gear that six porters agreed to push on: "Wearing our duvet-jackets they helped us bring the equipment up to Camp 1 (4200m) and then after giving encouraging cheers, they too returned to their villages." By the 1970s, Afghanistan's political and economic golden age was passing, and with it faded the prospects of a more robust mountain tourism industry. King Zahir Shah's reforms had always faced opposition, but discontent—especially among the growing socialist movement and the powerful conservative southern tribes—was growing. If the country had a veneer of stability during its golden age, Afghan-American historian Tamim Ansary writes in Games Without Rules: The Often-Interrupted History of Afghanistan, it was only because "the new Kabul and old Afghanistan," as he called them, "were evenly matched: equilibrium was not stability." In a declassified diplomatic cable from 1972, US Ambassador Robert G. Neumann was blunter in his analysis of the challenges, which included "continued university standstill, sluggish economy, high food prices," a "'hold-the-line policy' on Pushtunistan" and "high level corruption, administration malfunction and continued absence [of ] parliamentary quorum." In 1973, when King Zahir Shah traveled to Italy, his cousin, the prince Mohammad Daoud Khan, took advantage of popular dissatisfaction and overthrew the monarchy, replacing it with a republic, with himself as president. Five years later, Daoud Khan and most of his family were assassinated in a Communist coup. Fighting broke out across the country. Then in 1979, the Soviet Union invaded Kabul in the name of quelling opposition and supporting its client state. Its actions only fueled the resistance, though, beginning the near-decade-long Soviet-Afghan War, which had barely concluded in 1989 before the outbreak of the Afghan Civil War, as previously allied militias now turned on each other, vying for control. By the time the Taliban regime came to power in 1996, mountain tourism in the jade and silver peaks of the Hindu Kush had long been far from anyone's mind. Instead, Afghanistan's mountains served different purposes: as natural defensive barriers; launching points for attacks; a refuge for fleeing civilians; and a symbol of hope for a beleaguered people praying for peace. IN THE MOUNTAINS, when the only thing to do is the only thing one can do—breathe, swing axe, step, repeat—the exactitudes of timekeeping feel irrelevant, as if the altitude not only thins the air but also warps the ticking of clocks. To many foreign travelers since the age of empire, the entire country of Afghanistan seemed bound by the same magic. Ever since it was imagined into existence, this idea of a time-locked land—set up in contrast to modernity—had prevailed in Western stories. It is "a country that would continue to exist more or less unchanged whatever disasters overtook the rest of mankind," wrote Newby in 1956; it is "that rare place that eludes time itself," declared Jacob Baynham in Outside Online in 2013. Incredibly, this myth persisted, despite three and a half decades of war; 6 million refugees who fled to Iran and Pakistan during the Soviet-Afghan War; and the 4,760 cell-phone towers and uncounted thousands of billboards advertising everything from television shows to wedding halls—unimaginable under the Taliban regime—that all compete for a slice of the Afghan sky. Instead, the nineteenth-century works of Rudyard Kipling remain part of the Western literary canon of the Afghan culture and people, even though he never set foot in the country. In "The Man Who Would Be King" (1888), Kipling describes Afghanistan as "one mass of mountains and peaks and glaciers, and no Englishman has been through it"; he calls the people "utter brutes." Meanwhile, lines from his poem "Young British Soldier" ("When you're wounded and left on Afghanistan's plains / and the women come out to cut up what remains") reinforce images of the country as the "graveyard of empire"—a moniker for Afghanistan that has been in use for so long that no one remembers whence it originated—and contribute to stereotypes of intractably hostile landscapes, bloodthirsty people and savage women. Many modern diplomats and journalists still turn to Kipling as a guide to Afghanistan. In a recent profile, American Scott Guggenheim, senior advisor to current Afghan President Ashraf Ghani, admitted to journalist May Jeong that he had done little beyond reading Kipling to prepare for his post. During his senate confirmation hearing, Lieutenant General John Nicholson, the current head of US Forces in Afghanistan, echoed Kipling by describing Afghans as "born fighters," as he argued to continue American military presence in the country. Even as new vocabulary adds to the lexicon of myth—"war-torn," "insurgency," "roadside bombs," "suicide attacks"—it still fits within a greater narrative of Afghanistan as an enduringly dangerous frontier land. WHEN SHE RECALLED her summit attempts in the Pamir Mountains months after the expedition, Freshta Ibrahimi's voice became laden with wonder. Like many Afghans, she had grown up with a deep appreciation for the natural world; each year, as the snow, frost and bitter winds blown in from frigid steppes were replaced by the gentler gusts of spring, Afghan families would head outdoors to enjoy hilltop picnics. Having traveled so far and, with Ascend, trained so long in the lesser hills of Kabul, she ached for the chance to prove herself. "As I go up, I became more selfish. I believe in myself...in my strengths, my goals, my dreams," she said. Ascend, the program that sponsored Ibrahimi's trip to Koh-e-Pamir, was co-founded by American aid worker Marina LeGree and Badakhshani activist Faisal Naziry. In a country where national narratives were shaped by the rugged terrain, LeGree and Naziry believed that the symbolism of women ascending its peaks would be especially powerful. 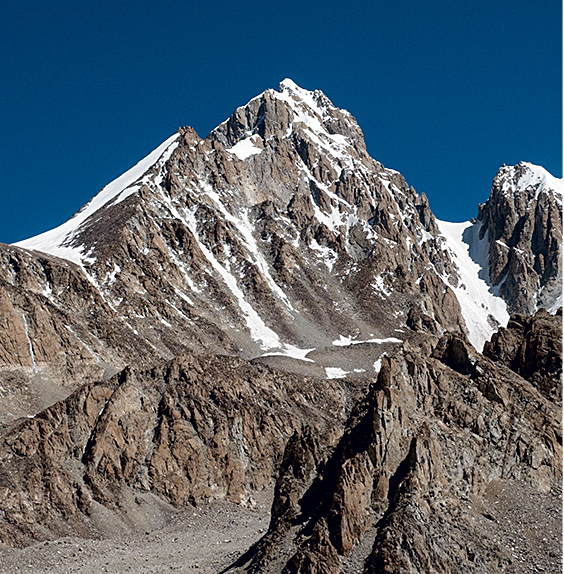 After Ibrahimi and her team established base camp at 4600 meters, they set out to attempt an ascent of Koh-e-Pamir. But they didn't get far. As they began to cross the first major snowfield at 5100 meters, the clear skies of the past week darkened with the signs of a coming storm. They turned around, to Ibrahimi's disappointment. The next day, while the rest of the party went to explore other climbs, Ibrahimi stayed behind at base camp to care for one of the women who wasn't feeling well. When the others returned, they were breathless in their description of the poison-blue color of the icefalls, the foreboding grandeur of the Issik Glacier and the glittering emerald of distant lakes. Ibrahimi cried for all that she had missed. It was not until the following day, when she set out with Lund and Hanifa to attempt another summit, that her heart was at ease again. Finally back out on a mountain, Ibrahimi felt a freedom that she became loathe to give up. With each step, as her crampons dug into the firm ice, she felt more connected to the peak. When the sun was at its zenith, birds circled like specks of shadow in the wide sky above. She felt as though she had reached a new kind of understanding of nature; she saw majesty in the heights, even in their barren menace. "When it is snowy, when rocks are falling, even when it can kill me," she said, even then, the mountains are beautiful. THE CURRENT WAR in Afghanistan is in its seventeenth year, earning it the name, among American writers, of "the forever war." Following the September 11 attacks on the World Trade Center and the Pentagon, the US and its allies invaded Afghanistan in October 2001. By November, the Taliban government was driven from power, and 4.6 million refugees began to return from Pakistan and Iran. This was not an end to the war, however, but merely a reprieve; by 2006, Taliban attacks had developed into a full-blown insurgency. One of many hopes of local residents and aid workers for a post-Taliban Afghanistan was a revival of the country as an adventure travel destination. In 2003 Italian alpinist Carlo Alberto Pinelli, who had made numerous first ascents during the pre-Soviet era, returned to lead the first ascent of Noshaq in twenty-five years. The fifteen-member team, including one Afghan climber, followed the standard route to base camp. But unlike those who first climbed the peak in 1960, Pinelli's team now had to navigate around 640 landmines planted in the mountainside. Three decades of climate change had also left the peak drier than Pinelli remembered. The lower section had become "a huge heap of rubble," and the climbers had to bypass it over a glacier on the mountain's northern flank. From there, the team continued up a 1000-meter snow ramp to establish a series of three camps from 5400 to 6600 meters, where they discovered the old fixed lines from the pre- Soviet age. Four climbers—Fausto de Stefani, Francois Carrel, Marco Schenone and Irena Mrak—eventually reached the summit, signaling the rebirth of mountaineering in the Hindu Kush. Pinelli hoped that the success of his team would encourage more alpinists to return. Yet he realized that their trip had also exposed the lack of experienced local expedition staff. The Noshaq climbers had hired 136 porters from the village of Qazideh to carry three tons of food and equipment to base camp but, as Lindsay Griffin commented in the Alpine Journal, these "valley porters are totally unhappy with the thought of climbing on snow and any local high-altitude help would only be practical after a lengthy training regime." Pinelli aimed to provide that training. In 2005, at the request of the Afghan Ministry of the Environment, he organized the first of two mountaineering courses for twenty-two Afghan youth with the nonprofit Mountain Wilderness International (MWI) in the peaks around the Panjshir Valley north of Kabul. Nine of the trainees had been mujahideen fighters in previous wars, and two were women. The next year, MWI brought some of the strongest Afghan climbers to the Alps for additional training, including the newcomer Malang Darya, a Badakhshan local who had worked as a low-altitude porter and base-camp cook for Pinelli's 2003 expedition. It was during one of MWI's training sessions that four Badakhshani men, Malang Darya, Afiat Khan, Gurg Ali and Amruddin Sanjer, began confiding in each other their dreams—shared, it turned out—of climbing Noshaq. At that point, no Afghan had ever stood atop the country's highest mountain, and they wanted to be the first. In the documentary later made about the trip, Noshaq: Afghans to the Top, Darya expressed his long-held aspirations: "Thirty years ago, when I was a child, my father told me that tourists came to climb Noshaq. They became famous in their country. I dreamt of becoming a mountaineer, of climbing the mountains with the tourists." When French alpinist and aid worker Louis Meunier befriended the four men at the MWI training, he volunteered to help organize their Noshaq expedition. He organized fundraising, coordinated training for the Afghan climbers in his native Chamonix, and brought on two additional French mountain guides, Jean Annequin and Simon Destombes, to support the attempt. On July 19, 2009, Darya and Sanjer reached the summit with Annequin. Standing between an inky blue heaven and a snow-dusted summit, the two Afghan men hoisted their country's flag into the wind, holding on tightly so that neither they, in their buoyant spirits, nor their flag would fly away. In a clip from the documentary about their experience, Darya rests on a boulder at base camp, his neon green jacket vivid against the bleak grey moraine behind him. "I'm lucky," he says, "because I've become a mountaineer." FOLLOWING PINELLI'S 2003 EXPEDITION, a slow trickle of foreign mountaineers returned to Afghanistan's peaks. Like the climbers of the 1960s and 1970s, many of them focused on the summits of the Wakhan Corridor—as much for the clustering of objectives above 6000 meters, as for the easier accessibility from Tajikistan, perceived as a more secure departure point than Kabul. 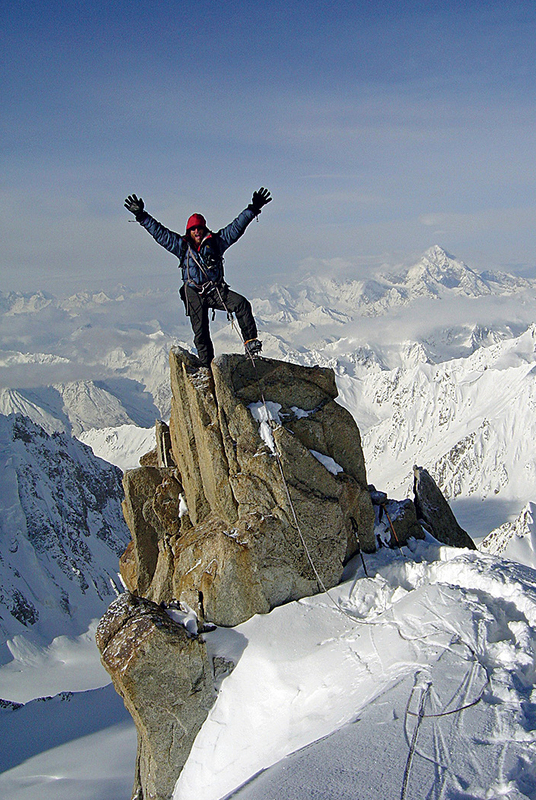 In 2005 Doug Chabot and Mark Jenkins reported the first ascent of Koh-e-Bardar. It was the first time that anyone had made a recorded first ascent in the Wakhan since 1979. Despite being held in Tajik custody for five days at the border, Chabot later told the Bozeman Daily Chronicle that he hoped to return to Afghanistan before the opening of the tourist floodgates left the place swarmed. "Five years from now, you'll have all kinds of people going over there," he said. For a while, the predictions of Chabot and Pinelli seemed to come true. In 2005 Spanish mountaineers David Cejudo Fernandez and Luis Miguel Lopez made a probable first ascent of the 6040-meter Koh-e-Maghrebi in the Pamirs. 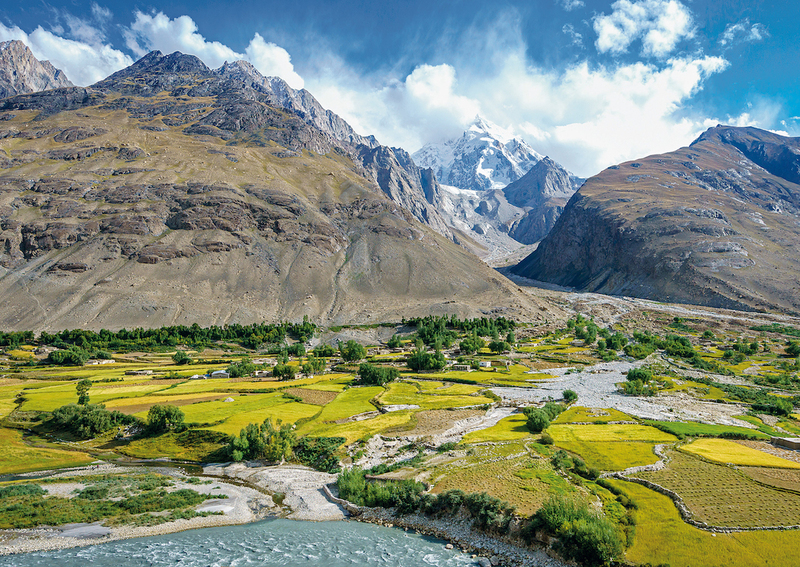 Between 2007 and 2016, an average of 155 tourists entered the Wakhan Corridor each year—a handful to climb, and many more to trek. Since 2010, alpinist Mike Libecki has made three trips to the crumbling, sandy spires of the Koh-e- Baba Mountains in Afghanistan's central Bamyan Province. In 2011 Australian Tim Wood and Afghan guide Aziz Beg (a MWI trainee) successfully summited Noshaq, making Beg the third Afghan to stand atop the country's crown. That same year, New Zealand sisters Pat Deavoll and Christine Byrch climbed a new route on the northwest ridge to the summit of 6515-meter Koh-e-Baba-Tangi, "a shining pyramid...rising above a tiny village of dotted houses and patch- work field," as Deavoll described in Alpinist 52. The last time that anyone had reached the pinnacle of Koh-e-Baba-Tangi was in 1963. On the rappel down the mountain, Deavoll encountered burnt sticks: "campfire relics" from the past ascent. DESPITE THE HOPES of the Afghan Tourism Organization, international development organizations, and both foreign and local alpinists, few Afghans are making a livelihood off the mountains. 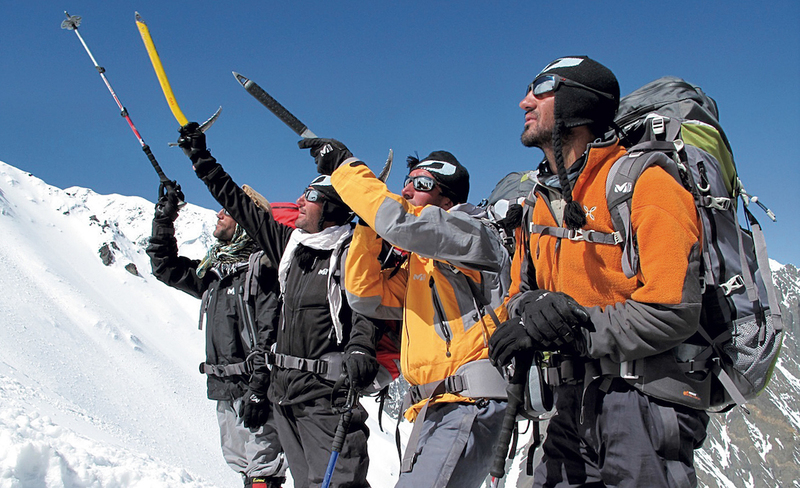 Of the four men who set out to climb Noshaq in 2009, only two of them—Darya and Khan—work as mountain guides. Sanjer, along with the third Afghan climber to reach the summit, Aziz Beg, remain employed at the nonprofit Wildlife Conservation Society. None of the climbers, however, has the funds to pursue their own objectives after Noshaq, or even to purchase their own mountaineering equipment. For others, work is even more sporadic. Most of the climbing expeditions that arrive in these mountains don't employ guides at all. After the cooks and low-altitude porters that a Faizabad-based outfitter hired for Deavoll's first and second trips didn't show up, she decided to take charge of finding staff for the third trip herself. Men in remote mountain villages compete for the limited expedition jobs that supplement their income as subsistence farmers. As Darya describes, villagers in Qazideh, the starting point for treks to Noshaq, generally only work as low-altitude porters once a year, carrying 20kg for three days. In Sarhad, the staging ground for treks to the Little Pamir, meanwhile, villagers employ a rotating system to hire out their pack animals between two and three times a year, so that "an animal from each household has [a] turn to work." In 2012 Deavoll paid each of the twelve porters from the village of Qalar-Panja approximately $5 per day—a fortune in comparison to Afghanistan's per capita income of $596.30, according to the World Bank. On her trip with Ascend, Ibrahimi noted that the seventeen porters they had hired slept in the cold, wrapped only in traditional wool blankets that provided little protection from the low temperatures. (When the porters returned four weeks later to pick up team's gear, the organizer Malang Darya brought along two tents for their use.) The team had taken longer than anticipated to reach base camp, and had exceeded the number of days—four in total, including the return journey—for which they had hired the porters. While Lund offered to increase their pay for the extra work, the porters declined, and left the group at 4550 meters, 600 meters below their intended base camp on an uncovered moraine at the foot of Koh-e-Pamir. Ibrahimi was frustrated for herself—but also sympathetic to the porters' plight. In addition to the economic insecurities of relying on tourism, there are other tensions, says Gull Hussein, who has worked in the industry for seven years in a variety of roles, ranging from tour guide to guest-house owner to Kabul-based outfitter. In more conservative parts of the country, Hussein and his guides have faced resistance, often from younger generations. "Many times [locals] stop me, asking, Why do you bring non-Muslims here?" he says. But the older ones "remember [the] 1960s and 1970s." Nonetheless, Hussein remains optimistic. His own business is better than ever. The security concerns that have pushed other local competitors out of the field have left his outfit as the only one to handle the small stream of visitors, and he recently added several new adventure sports tour options, including kayaking and rafting in the Panjshir Valley, in addition to the skiing packages that he's had for years. By most accounts, violence in Afghanistan is worsening. According to the UNAMA, 11,418 civilians were killed or injured in 2016, compared to 5,969 in 2009. 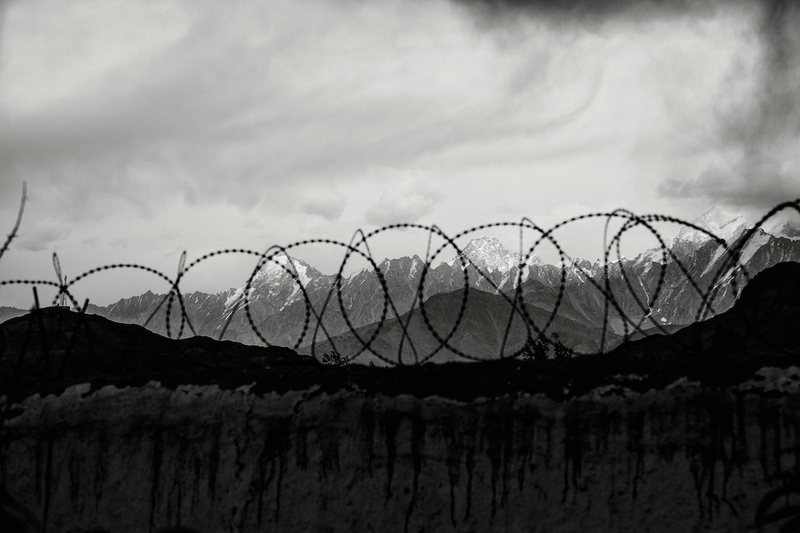 Many Afghans—including mountaineers—are leaving the country. Nadjib Sirat, who returned to Afghanistan in 2010 from France, where he had resettled, to pursue climbing and who founded the first Afghan Mountaineering Federation, left Afghanistan—and appears to have given up mountaineering—after attempting Everest in 2011. Sediqa Mayar Nooristani, a prominent female climber and the founder of the Afghan Climbing and Mountaineering Federation, is in Europe, while another MWI graduate, Azim Rajabi, now lives in Washington. This is representative of a larger trend. Between 2015 and 2016, an estimated 386,000 Afghans had applied for asylum in Europe, making Afghan applicants the second largest migrant group on the continent after Syrians. While many Afghans are leaving the country as refugees, many more are unable to depart. "In other countries, living in the mountains is even more expensive than living in the city," notes Alishah Farhang, who [competed] as a downhill skier in the 2018 Winter Olympics. But some residents of the highlands of Afghanistan, he says, have to stay there because they "don't have any other place." To abandon their livestock and farmland would be an act of desperation. Nevertheless, by 2016, over 1.5 million people had been internally displaced from their family homes in rural areas. Between training sessions in the Swiss Alps, Farhang returns to his native peaks of Bamyan, and he acknowledges that his involvement in mountain sports has given him a respite unavailable to most. But even as an Olympic athlete, Farhang depends on a meager salary from the Bamyan Ski Club, founded by foreigners and fully funded through donations from skiers in Switzerland. And if Afghanistan's most successful alpine athlete cannot make a living in the mountains, what possibilities are there for those with less acclaim? EFFORTS TO DEVELOP mountain tourism in Afghanistan have been start and stop, influenced often by outside factors: the fluctuating security of the region itself, as well as the departure of key players in the mountaineering community. The halting progress is not altogether unlike the process of acclimatization: pushes for altitude followed by rests at lower camps, tactical retreats as shifts in weather dictate, a slow and unsteady progress rewarded, with any luck, by a summit and a return to lower ground. But in Afghanistan, luck has been in short supply. While Ascend's Pamir team was preparing for its expedition north last spring, a 10,000-ton truck bomb detonated outside of the German Embassy in downtown Kabul. The explosion killed over 150 people and injured 450 others, leaving a thirteen-foot crater at the center of the capital. The next day, protestors gathered to call for the resignation of senior government officials, including President Ashraf Ghani, for their inability to protect Afghan citizens. Some threw stones, and guards responded with fire, killing at least nine protestors. A day later, a suicide bomber attacked a funeral for the newly departed, turning twenty who had walked in as mourners into twenty who were carried out, as the newly mourned, on stretchers. The unrest is even making its way to the Wakhan Corridor, long spared the violence that has plagued the rest of the country. With only one road meandering into the valley, and tall protective crests on all sides, the chance of invasions had been low. At the start of the summer tourism season in 2017, however, the fighting between government forces and the Taliban reached as close as thirty-five kilometers to the dusty border town of Ishkashim, gateway for trips into the Wakhan, where many villagers depend on the limited tourist revenue for their livelihood. The Taliban's foray into the Wakhan was short-lived, but so too is the area's isolation. China intends to lay a fiber-optic internet cable across the Wakhan, and plans for a Chinese-built military base are also underway in the region known for its dun-colored hills, summery green valleys and glacial blue rivers that reflect the sky. IN OCTOBER LAST YEAR, two months after her expedition to Koh-e-Pamir, Freshta Ibrahimi spent a few days visiting alumnae of the Ascend program. She met with three sisters—nieces of the famed mountaineer Sediqa Mayar Nooristani—who had been involved with Ascend in the past, but were no longer. They had an uncle who did not approve of their time outdoors. 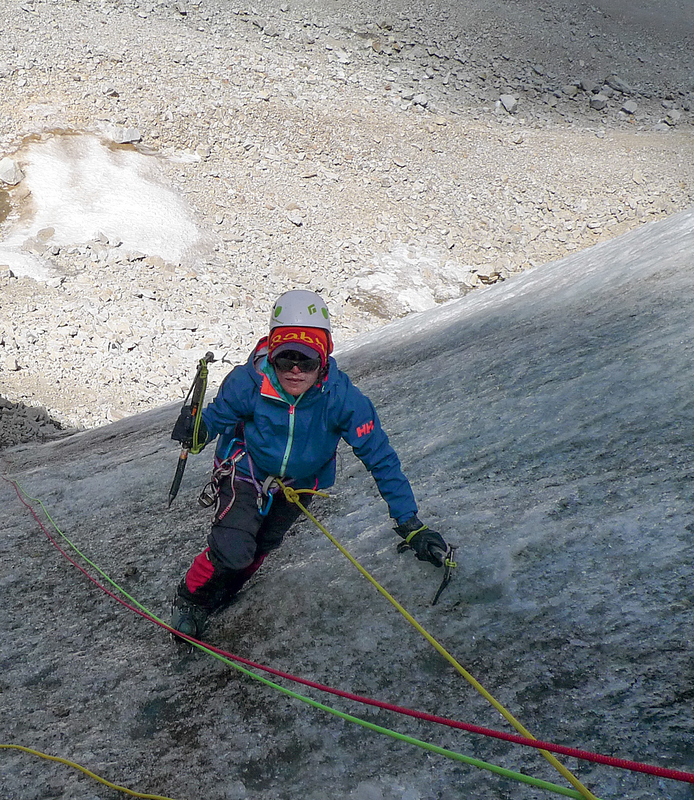 Other alumnae were not prevented from alpinism, but were uninvolved all the same; they simply had too much else to worry about between the requirements of school, work and family obligations. Their goals have gotten smaller, Ibrahimi said. Without the structure and support system of Ascend, she reported, "Some of the girls, they lost their dreams." I asked her what that meant. "What do they see themselves doing in ten years?" She was quiet. Then, "I don't know. Maybe get married?" For many Afghan women, marriage is not a choice, and, depending on the wishes of their in-laws, it may signify the end of their studies or career. For Ibrahimi, working at Ascend has made her the breadwinner for her extended family, and the income has earned her respect and freedom to pursue her dreams both on the mountains and off. 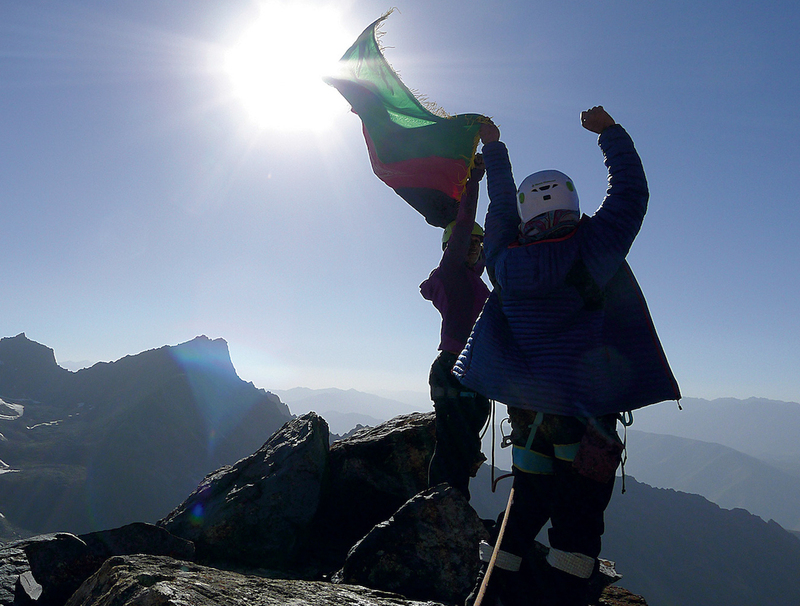 Perhaps it is this independence that best speaks to the potential of alpinism in an Afghan context. As social media feeds stream images of men and women in the mountains, young Afghans see potential and possibility in the landscape that they previously regarded as a backdrop, if not a barrier, to their dreams. There is an old Afghan saying about going mad and taking to the hills. Sometimes it is love that drives people to them, as in the Persian tale of ill-fated lovers Shirin and Farhad, who, in one folk version of the story, unite in the mountains only in death. At other times, desperation is the motive, as in the legend of Uruzgan Province's Hill of Forty Maidens, where forty girls were said to have thrown themselves off a mountain rather than accept conquest. And at still other times, to go to the hills is an act of resistance, as with the legions of Afghan fighters who have staged attacks from mountain hideouts. The altitude record that Ibrahimi and Hanifa set could serve as an addition to this centuries-old collection of legends, a strong visual symbol of women struggling for the right to be seen, heard, and free to make their own choices, a counterweight to more typical images, in media and elsewhere, that portray their helplessness and subordination. Perched atop the steep gully of loose rock and ice on that nameless peak in the Pamirs, Ibrahimi realizes that she no longer needs the external validation of a summit for herself. Alone with only her companions, she sees the mountain as it is—its cloud-dappled crest resplendent, unattainable—and the transcendence that she experiences is, in the moment, enough.